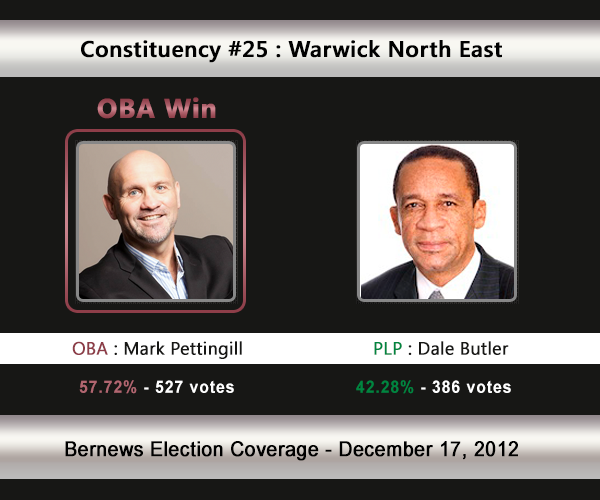 [UPDATE Dec 17: Election Results] Another big win from the OBA sees Mark Pettingill [OBA] oust the incumbent Dale Butler [PLP] in C#25 Warwick North East. Mr Pettingill moved to this seat to challenge Mr Butler. The OBA pick up a seat and the PLP lose one of their well-known figures. Dale Butler is out of the House. Expected to be a closely watched race, the OBA’s Mark Pettingill moved from his more secure Warwick West seat to challenge the PLP’s Dale Butler in Warwick North East. This is the second time these two gentlemen will match up. In 2007, Mr Butler won 53.5% of the vote vs the UBP’s Gina Spence [494-426]. In the 2003 General Election, Mr Butler [PLP] won with 52.27% of the vote against Mark Pettingill [UBP] who received 47.73%. 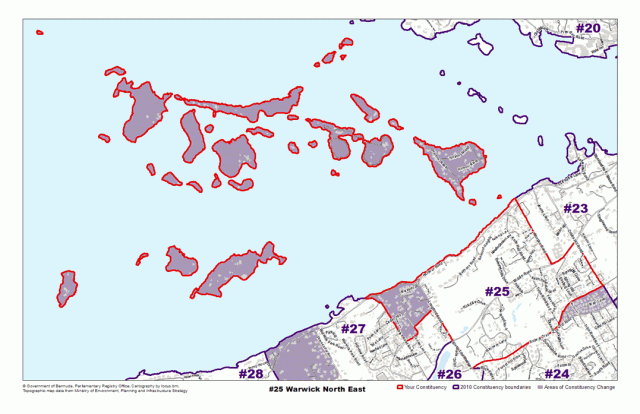 Areas the Warwick North East constituency compromise, or is located by, include Longford Road, Harbour Road, Morgan Road, Cobbs Hill Road, Ord Road, Tribe Road No. 2, the Railway Trail, Tribe Road No. 3 and Olive Bank Drive. Mr. Dale Butler is an educator and author with a record of service to Bermuda through his political and community involvement. He became a member of the Progressive Labour Party, which he joined at age 16 and has continued to serve in the political arena since then. Born and raised in Paget, he was educated at Central School, The Berkeley Institute, the University of Sussex (UK); Indiana University and Miami University. He has also completed graduate courses at Vermont University, Colombia and Harvard Universities. His academic credentials include a Certificate in Education, B.Ed. (Hons), M.Ed. and M.A. At the age of 28, he was the youngest principal ever appointed and gives credit to Mr. Clevelyn Crichlow for encouraging him and to Mrs. Carol Bassett and Dr. Melvyn Bassett who mentored him. He served St. George’s Secondary for 12 years as Principal; then 4 years as Principal of the Dellwood Primary School where he successfully oversaw the transformation of the school to Northlands as part of the education reform package. In 1998, he was elected to Parliament in Warwick East. In 2003, under the new single seat constituencies, he ran in Warwick North East and from 2003-2007 served as Minister of Community Affairs and Sports. In 2007, he was appointed Minister of Culture and Social Rehabilitation. He currently represents Warwick North East, Constituency 25. Widely known as the King of Fishcakes, Mr. Butler is an accomplished author of fifty books and has produced four documentaries on a variety of topics. Among his accomplishments ate: The initiation of the Charles Bean Memorial Lecture, The Dr. E.F. Gordon/Wilfred Allen Memorial Lecture, The Rubber Tree Festival, The Bermuda Musicians and Variety Artists Hall of Fame, The Bermuda Triangle Cultural Festival, JOBB and The Drum Major Awards. During his tenure as Minister for Government, he requested for Govt. to implement: The National Heroes Day, Completed the Cricket and Hockey Pavilions, The successful 2004 Carifta Games, The 2005 20/20 Cricket competition, Bermuda’s first and second Drum Line Festival at the National Stadium, Mirrors: Youth Development, Sir Stanley Burgess Day on May 23rd , The 400th year anniversary celebrations, Initiated: Bermuda Heartbeats Historical Lectures, The Lionel Pearman/Doreen Lightbourne Memorial Lectures, The Dr. Kenneth E. Robinson/Cyril Packwood Memorial Lecture, The first book of National Poetry and the $10 million cricket award. Among his successful constituency activities is the conducting of employment clinics. Mr. Butler is a member of St. Paul A.M.E. Church. He is married to Marrah Tijamo and is the proud father of two sons, Russell and Jay. Mark is a prominent lawyer in the community having been a Crown Counsel, Defense Attorney and Acting Magistrate since being called to the Bar in 1991. In 1999, Mark became a Senator and was appointed Justice of the Peace. Raised on Ord Road in Paget, Mark attended Gilbert Institute and Warwick Academy where he was Head Boy. Mark continued his education overseas first gaining a BA and then a B. ED from Mount Allison University in 1987. Mark then travelled to London, England to attend law school at Grays Inn. Despite a busy schedule as a practicing lawyer and father of three, (Zach, Sophie, and Holden ) Mark does enjoy the quiet life. He lives by the sea in Devonshire with his partner Erin, practices yoga every day, is a keen book worm, keeps a wine cellar and loves to make a ‘mean’ meal using produce from his vegetable garden.